Upon log in onto the app, the fingerprint recognition would automatically read the users temperatures levels which would be associated with a mood or an emotional state. The users will then be able to be provided with options. Question and answers: Question asked “how you are feeling today?” associating the user emotional state with a colour or a tone. Then after the user has chosen their color it will also ask the user “what are they wearing today” answer with a word, answer with picture or to answer with both. Track or prediction: To track or give a prediction of the users most “AWESOME DAY/ CHE FIGO day!” * (this will be based upon the users previously input data. The first week would unavailable * grayed or muted out* until the algorithm gathers enough information. Profile: Would be consisted of categories of clothes that would be pre registered to the app. Also the options to add articles of clothing to the users “online wardrobe” would be classified within the different categorizes. 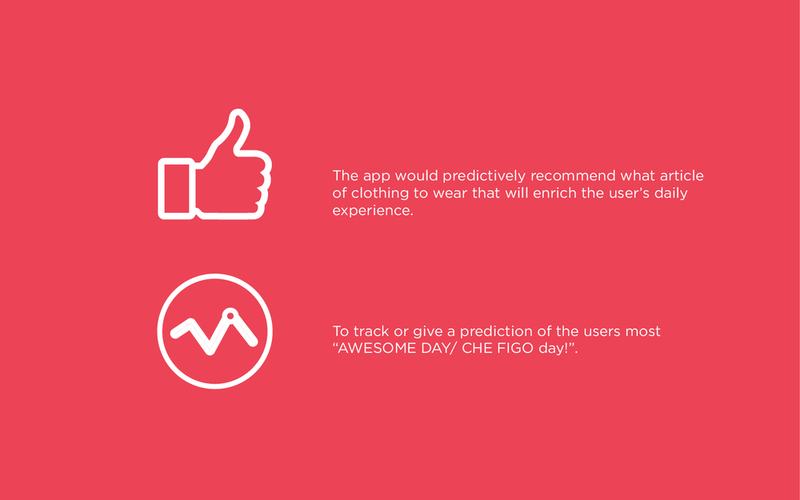 There would also be an “outfit of the day” or “CHE FIGO day!” that can be recommended based upon previous data. The app would also incorporate an option of social sharing. facebook, twitter, instagram etc. for encouragement or options.